Mary-Ann Constantine is Reader at the University of Wales Centre for Welsh and Celtic Studies. She works on C18th Welsh literature and is currently leading the AHRC-funded project, Curious Travellers: Thomas Pennant and the Welsh and Scottish Tour 1760-1820. This gentleman is now engaged in an actual survey of North Wales, and of publishing a large map of that part of the principality: a work extremely worthy of public encouragement. A further account of the plan will be published in the last page of this volume. 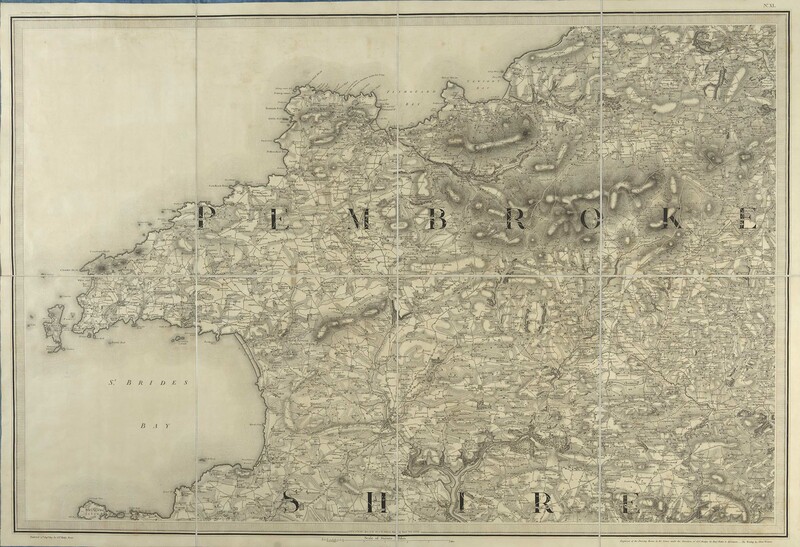 At the end of the book we do indeed find ‘Proposals for publishing by Subscription from an Actual Survey a large six-sheet, and also a smaller Map, of the Six Counties of North Wales by John Evans’. At the bottom of the page, presumably to encourage the subscribers, appears the line: ‘N.B. : the Work is now under the Engraver’s Hands’. Few of us have not promised to meet unfeasible deadlines, and John Evans had set himself a huge and complex task. But that map was a long time coming by any standards. As Paul Evans has shown, by 1792 Pennant found himself compelled to draft a letter to a local newspaper on behalf of the by now rather irate ‘North Wales Subscribers’, making it clear that unless something happened soon they were considering ‘entering into new arrangements’. In the event the map, twenty years late, was still not published for another three years. In 1795, when it appeared, its creator died. Two years later his son, another John Evans, published the promised ‘smaller Map’, which his father had also prepared. 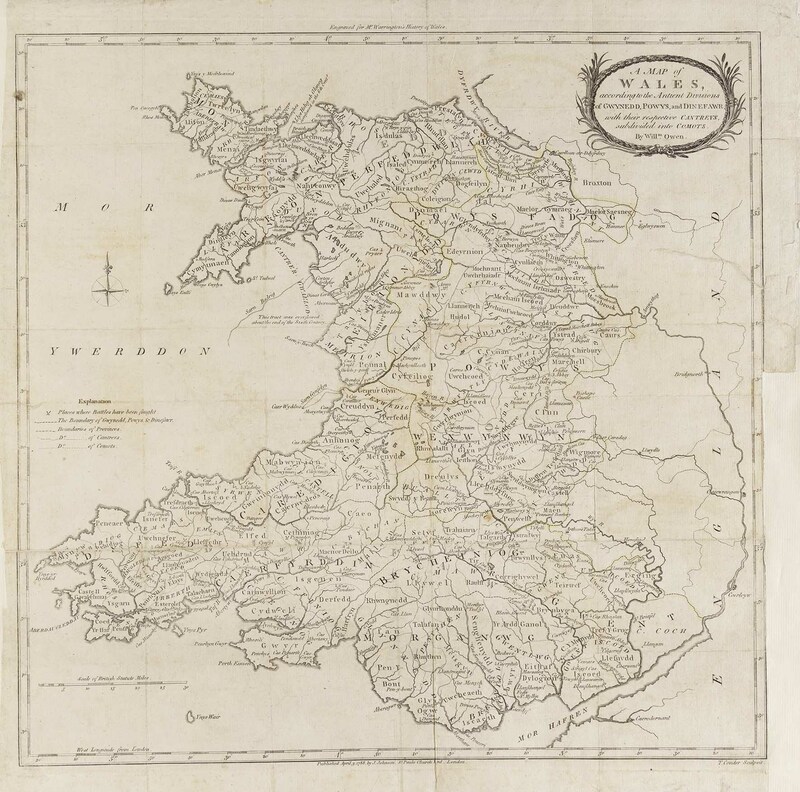 Most cartographers agree that John Evans’s 1795 work, which was eventually published in nine large sheets, impressively raised the standard of Welsh mapping. Engraved by Evans’ neighbour, Robert Baugh, it has a wonderful clarity of lettering and detail, and comes close to the style of the Ordnance Survey, who would begin their work in Wales in 1810. An informative article by Derek Williams tells us more about the man himself and the circumstances of the map’s creation. Llwyn-y-Groes (now a Grade II listed building), near Llanymynech, is very close to the Shropshire border, and Evans was a landowner with artistic and antiquarian interests. Born in the same year as Thomas Pennant, the two clearly had much in common, and Pennant writes warmly of a visit to the ‘public-spirited’ Mr Evans in his Welsh Tour. Evans also provided information on local sites. One nice coincidence is that the mysterious Wat’s Dyke noted by Pennant on his ‘home patch’ at Basingwerk near Downing runs a diagonal forty miles down to Maesbury Marsh, only a couple of miles from Evans’s own house. It is marked as a confident black line on the section of the map reproduced here, running in parallel for a few miles at the bottom of the image with Offa’s Dyke, which disappears at Caergwrle just below Mold. A fascination with these border areas runs throughout Pennant’s writings on this eastern edge of Wales, and he draws on the testimony of place-names and (often inscrutable) archaeological monuments to evoke earlier periods of political flux and border warfare. Twenty years is a long time for any work-in-progress, and one cannot help feeling sympathy for Evans in his attempts to map a landscape undergoing so much change. Turnpike trusts meant new roads were being built; mines were exploited, cotton factories established, and smelting houses blossomed along the coast of the Dee; over in the north-west, Richard Pennant (Thomas’s distant kinsman) ploughed the profits from slavery into a rapidly-growing slate industry. In 1796 Pennant himself would map the distances travelled, rather poignantly, in his History of the Parishes of Whiteford and Holywell: revisiting the little wooded Greenfield valley, whose stream runs from St Winefred’s Well to Basingwerk Abbey, he describes a place now crowded with copper and cotton mills (‘by those behemoths of commerce, our little Jordan was soon drunk up’). Yet this, he insists, is progress, and he is proud of the contribution made by the busy stream, and its local investors, to the greater British economy. Zooming in to the Evans map around Holywell it is hard to tell quite what stage of industrial development is being represented here. The mills may be those little black dots along the stream; there is a ‘coal pit’ on the coast above Bagillt, and a ‘smelting works’ just under the castle at Flint. More clearly marked than the signs of rapid industrialization, however, are the houses and halls of the North Wales gentry, including Pennant’s seat at Downing. Of late years the tour of North Wales has become very fashionable, but the crowds who favour us with their company are clamorous after such a director to the picturesque Beauties of our country. 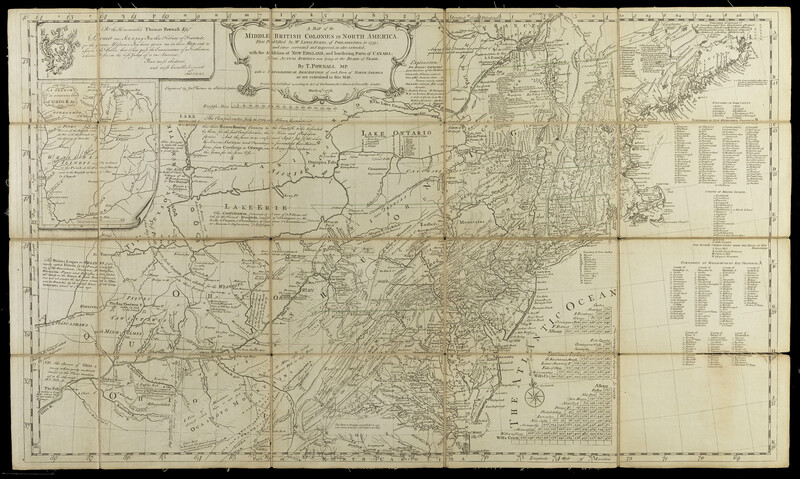 When Evans’s map did eventually become available—and particularly after his son issued the smaller version in 1797—it was welcomed by many. 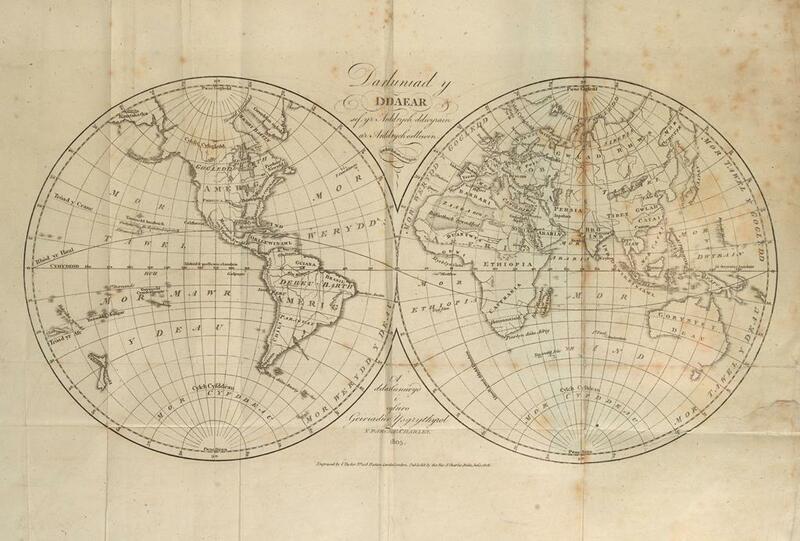 My final blog will look at the reception of the Evans map in the 1790s and 1800s, and explore some of the ways it was used by our curious travellers. 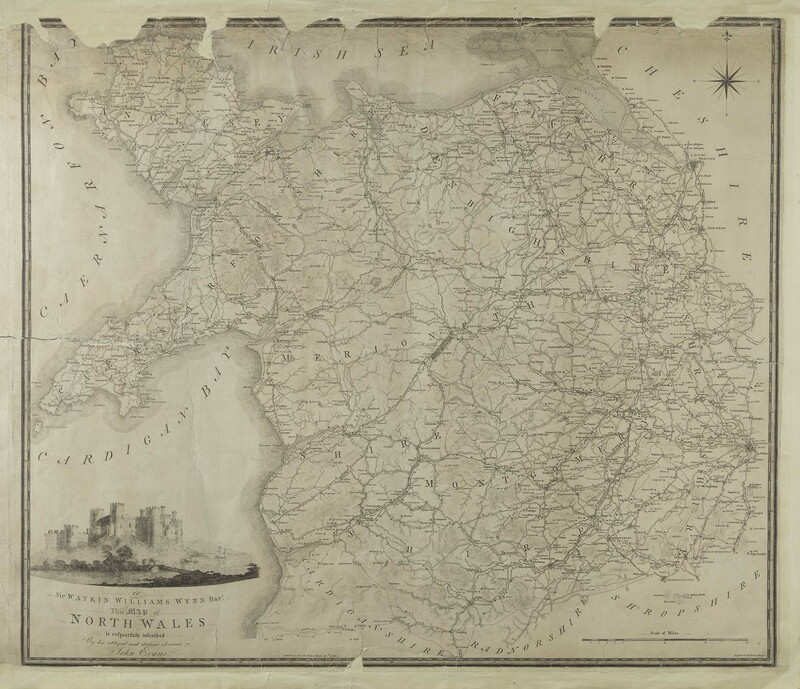 Derek Williams ‘John Evans’ Map of North Wales 1797’, Ystrad Alun 11 (Nadolig, 2010). R. Paul Evans, ‘Thomas Pennant’s Writing on North Wales’ (unpub M.A Dissertation, University of Wales, 1985). This is a map of the Welsh past, viewed from the vantage point of the late eighteenth century. It was created at a period when the past, and especially the medieval past, was an object of passionate enquiry amongst an industrious and dynamic group of writers and scholars, many of them based in London. It’s a complicated, intriguing, map, crowded with evocative names and hidden stories. It first appeared in the second edition of the Rev. William Warrington’s History of Wales (1788), and was designed and drawn by William Owen (1759-1835). Owen, who took the name William Owen Pughe after receiving an inheritance in 1806, was born in Meirionydd but had been living in London since 1776. He joined the Gwyneddigion Society around 1783, and by the time he designed this map (published with an accompanying map showing modern county divisions) he was already deeply involved in various projects aimed at recovering Welsh medieval texts, including the first ever edition of the poems of Dafydd ap Gwilym (1789). That work brought him into contact with, amongst others, Iolo Morganwg, who appears to have played some part in putting him in touch with Warrington. Who was William Warrington? We know that he came from a family in Wrexham, and that he spent most of his life in orders in the south of England, eventually becoming vicar of Old Windsor. He writes in his preface that his position as an ‘Englishman’ absolves him from accusations of partisanship in his History of Wales, which is full of admiration for the Welsh as defenders of their national liberties against their oppressors over the centuries. An anonymous manuscript and a couple of letters held here in the National Library tell us more about him than was previously known, and help to explain how this much reprinted history came into being in the first place. It’s a complicated story, involving subtleties of class, precedence and authorship worthy of Jane Austen, but it looks as though Warrington had originally planned to publish an ‘Antiquarian Tour’ of north Wales in the late 1770s. He was revising his manuscript for that purpose when he heard of Thomas Pennant’s impending publication, the Tours in Wales (1778) and realized that they would be, almost literally, treading the same ground. Warrington seems to have backed down and changed his mode of exploring the Welsh past from one which reads the past in situ, on a journey through the landscape, to a more academic, chronological narrative. The success of Pennant’s Tours, and, ten years later, his own History, suggests that he made the right call. 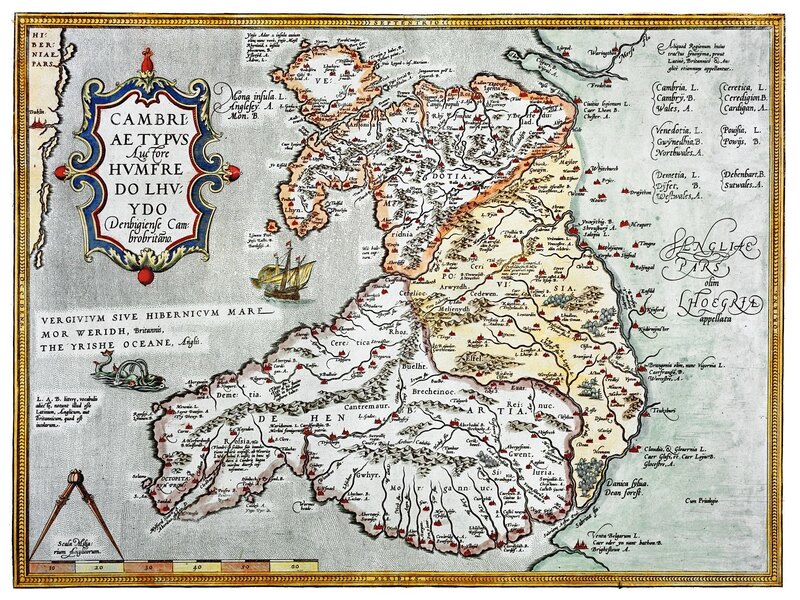 In an excellent article Iolo and Menai Roberts have analysed William Owen’s map from a cartographical point of view. This was the first attempt ever made to visualise the divisions of Wales right down to the level of commotes: to give shape and form, in other words, to the places evoked in the medieval texts. The main source for these names, they show, was a list collated by the scholar Sir John Price (?1502-1555) which had appeared in David Powel’s Historie of Cambria (1584), also an important source for Warrington. Though disparaged by early twentieth-century scholars, who associated William Owen Pughe with his later eccentric spelling reforms (and, worse still, with Iolo Morganwg), the Roberts’s article shows what an achievement this 1788 map really was. Besides the names themselves, which have an attraction all their own (Perfeddwlad, Anhunog, Yr Ardd Ganol) there are other curiosities to note here. Both Cantre’r Gwaelod and Llys Helig—the drowned territories of Welsh legend—are marked on the map with brief explanatory notes ( ‘This Tract was overflowed about the end of the Sixth Century’); Watts Dyke, not Offa’s Dyke, forms the border with England, and Bristol (Caerodornant), Gloucester (Caerloyw) and Worcester (Caerwrangon) only appear under their Welsh names. ‘Druidical ruins’ appear on the slopes north of Barmouth, and Beddau Gw?r Ardudwy (The Graves of the Men of Ardudwy) are marked just above Harlech. This is a landscape of stories, or rather hints of stories, to be pieced together further from clues and allusions in the slowly-forming canon of early poetry and prose. The map also marks innumerable battle-sites and castles: not just the usual Edwardian suspects, but scores of others, all testifying to the fact that these ‘Divisions’ were often indeed real divisions, and that medieval Wales was not a settled or peaceful place. The shifting allegiances, the alliances and hostilities of the Welsh kingdoms with each other, and with different factions of Saxons, Normans and English are all evoked in this patchwork-quilt of territories. The constant strife of the middle ages is a recurring theme in later tourist narratives. In 1813 Richard Ayton noted of the peninsulas of Gower and Pembrokeshire that: ‘as both were inhabited by the same people, engaged continually in the same kind of warfare, their general history is necessarily very much alike, and in both of them castles are as multitudinous as milestones.’ Many, like William Warrington himself, felt obliged to conclude that, admirable as that Welsh fighting spirit may have been, they were better off exchanging their ‘wild and precarious liberty’ for a different kind of ‘freedom secured by equal and fixed laws’, through ‘uniting in interests, and mingling in friendship with their conquerors’. Warrington’s conclusion has, inevitably, coloured assessments of him as a historian. But, as William Owen’s beautiful and intriguing map suggests, this does not really do justice to his deep engagement with Wales. There is still much to discover about the intellectual connections between Wales and England at what was a fascinating and significant period for both cultures. Tomorrow The National Library of Wales and the Royal Commission on the Ancient and Historical Monuments of Wales will be holding the third annual Carto-Cymru – Wales Map Symposium at the National Library in Aberystwyth. 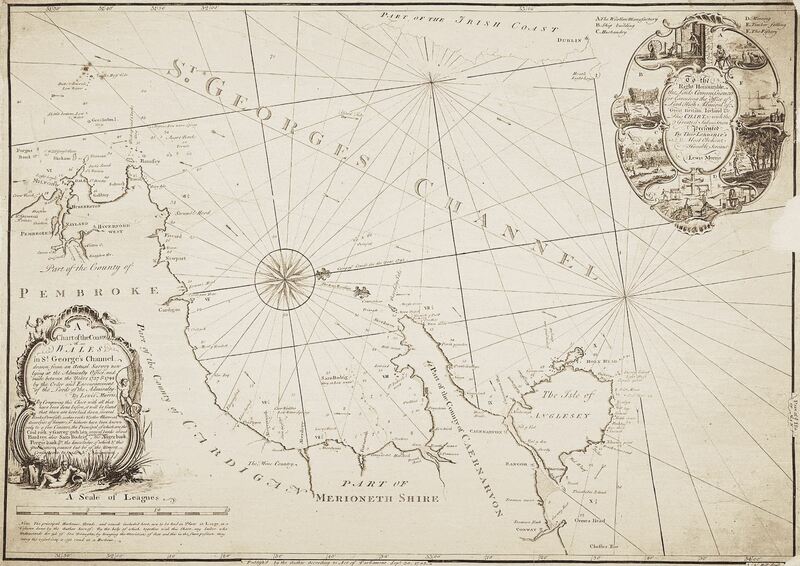 Our theme this year is Charting the Seas, but for this blog I decided to take a look at some of the great names in Welsh cartography and their achievements. 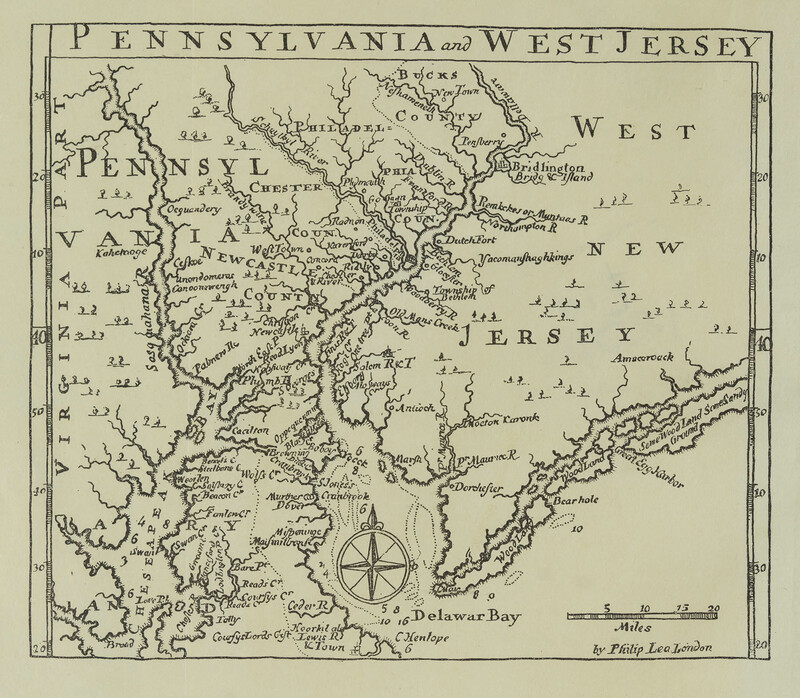 Gabriel Thomas was a Welshman who settled in Pennsylvania and wrote a book about the colony, this book included an early map of the colony produced by the London mapseller Philip Lea. 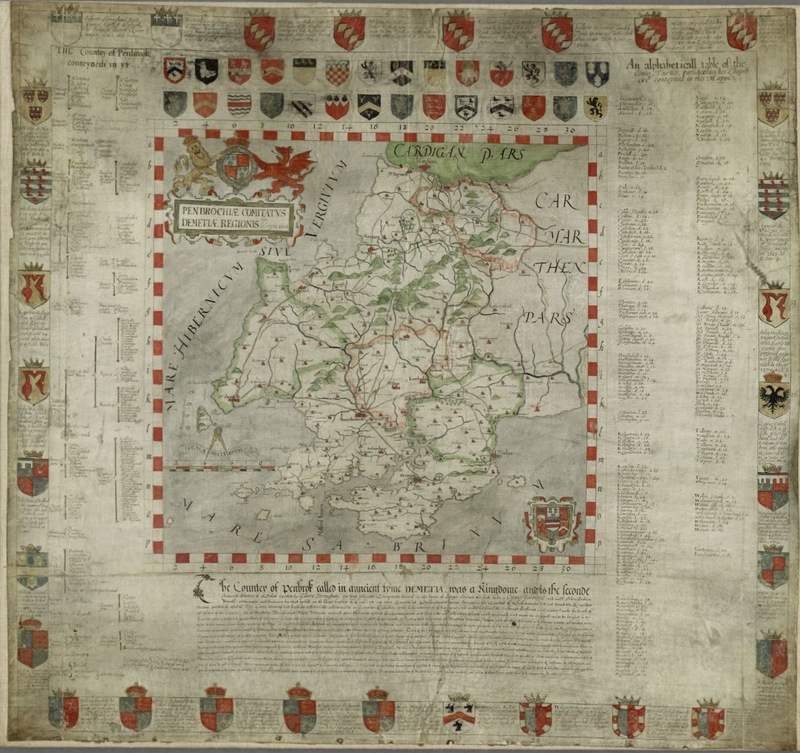 Emanuel Bowen’s map of South Wales was the most detailed map of South Wales available when it was published and remained so for a generation. Lewis Evans was another Welshman working in America, his map of the British colonies is one of the most important and influential maps of the period, and was still being reproduced at the time of the War of Independence. 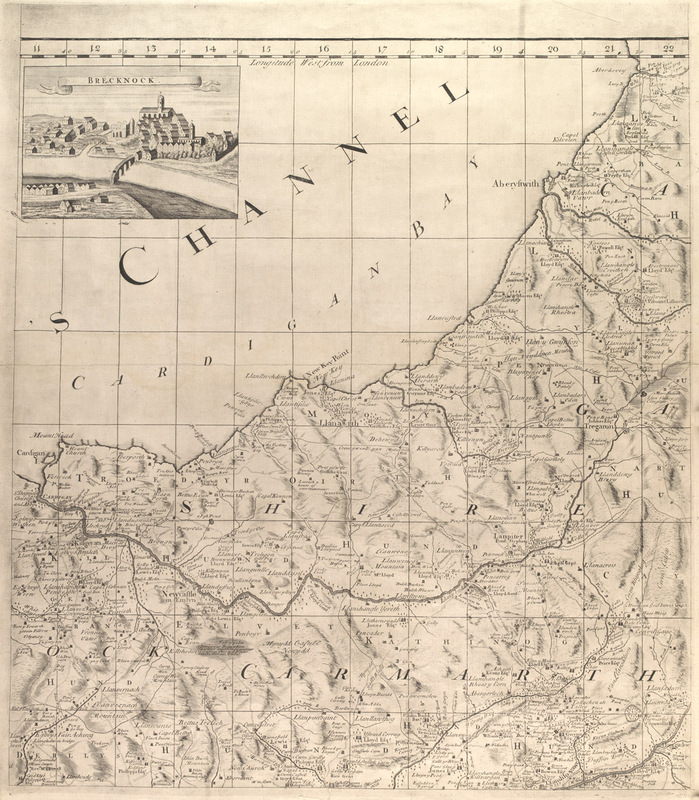 John Evans’s map of North Wales did for that part of the country what Bowen’s map had done for South Wales, i.e. provide a detailed standardised portrayal of the area. Dr Bob Silvester, FSA, Visiting Professor, University of Chester takes part in our #LoveMaps campaign. A professional archaeologist for all of his working life, first in Devon and Somerset and later in Norfolk, he moved to Wales in 1989 when appointed deputy director of the Clwyd-Powys Archaeological Trust. He retired from CPAT at the beginning of 2016, and for research purposes he is now affiliated to the Department of History and Archaeology at the University of Chester. 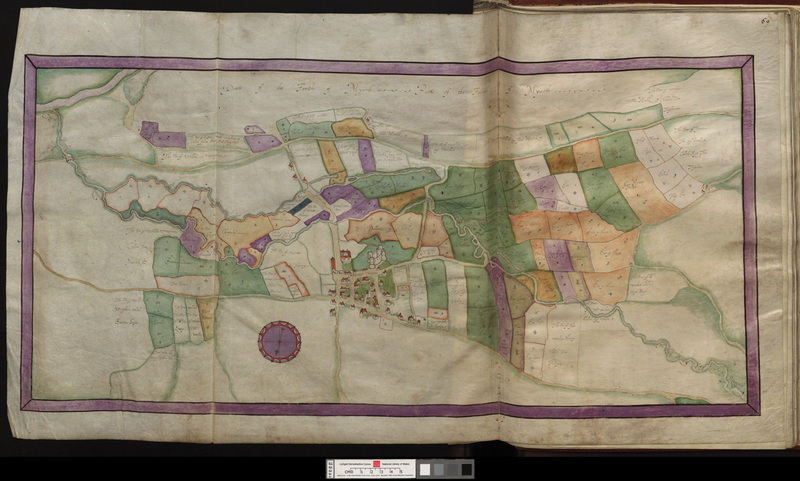 His interest in all types of historic maps, but especially estate mapping, emerged during his time in the Norfolk fenlands where maps were a vital adjunct to the fieldwork that was unravelling the development of the historic landscape. 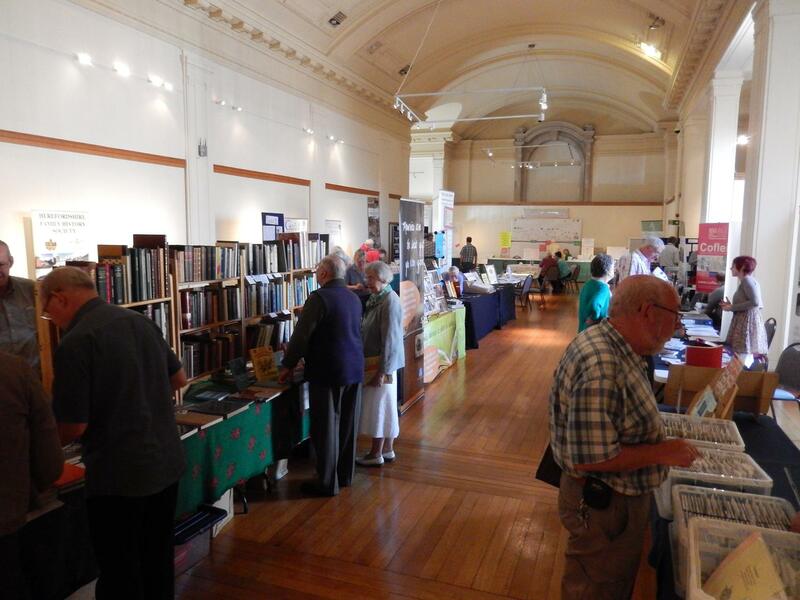 Over the last twenty-five years his interest in mapping has grown, and now with retirement, he is able to spend more time immured in local record offices and, of course, the National Library, examining maps of east Wales and the adjacent border counties in England. Estate map coverage across the counties of Wales is distinctively uneven. Monmouthshire can boast some impressive and extensive surveys, now held in the National Library, from the second half of the eighteenth century by the likes of Robert Snell and John Aram. Radnorshire on the other hand is arguably the most impoverished of Welsh counties when it comes to estate surveys. 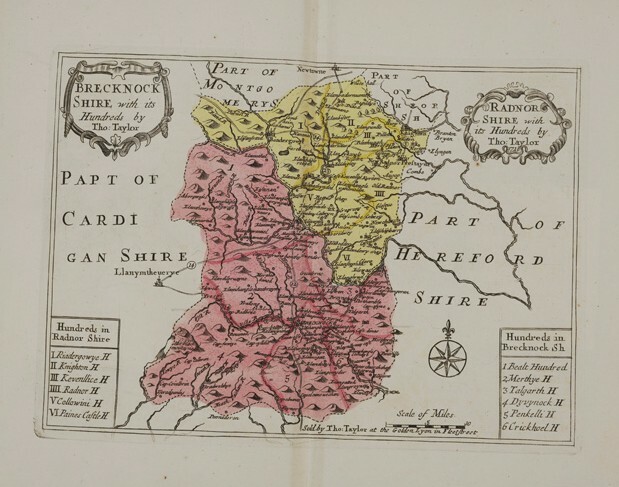 Geographically between the two is Breconshire, a county that produced only two or three land surveyors during the course of eighteenth century, and whose estate map legacy is decidedly unremarkable. One surveyor, though, whose work in the county is of particular interest was Edward Thomas who came from Margam in Glamorgan. The National Library has amongst the Tredegar archives, a fine volume of Thomas’s surveys of Charles Morgan’s holdings in Breconshire undertaken in 1780-1. A companion volume in the sense that it is very similar in its appearance and layout was prepared in 1780 for the Breconshire estates of Lord Camden, although direct comparison has to rely on digital images of the title pages, maps and schedules for this one is held in the Kent county archives in Maidstone. 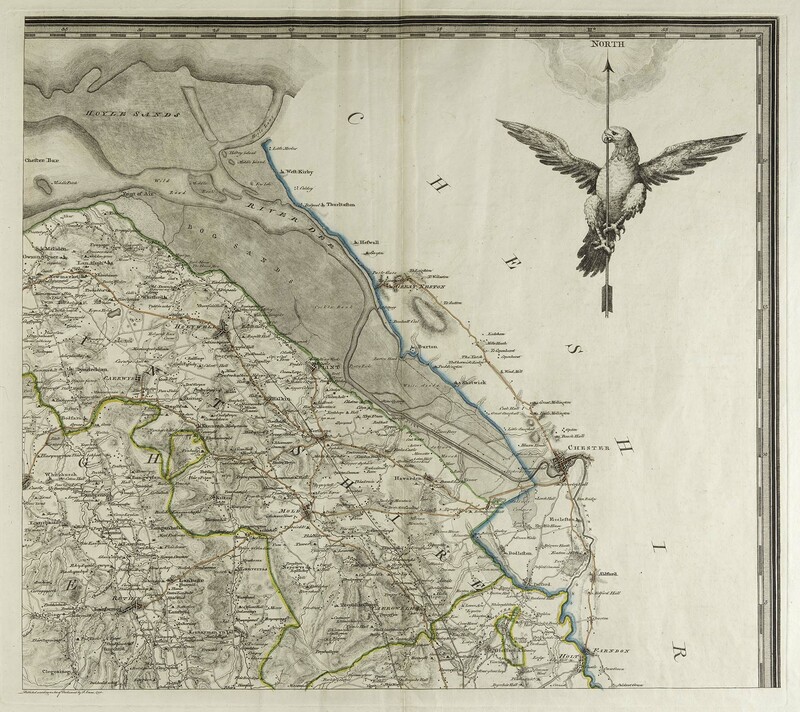 A third Thomas ‘atlas’ of estates in the county belonging to George Venables Vernon of Britton Ferry dates from 1776 and is now in the West Glamorgan archives in Swansea. Collectively, these three surveys cover in excess of 14,000 acres and thus around 3% of the land surface of the historic county of Breconshire. This may not appear a particularly impressive figure but is rather more than many eighteenth-century surveyors will have achieved in any region of comparable size. And for the landscape historian Edward Thomas offers some unanticipated benefits. Many surveyors were content to map just the field layout, the watercourses and the roads and lanes passing through their patron’s estate, and the buildings within its bounds. Much less commonly, a surveyor incorporated incidental features that he came across in the landscape, features that add next to nothing to the agricultural picture that he was commissioned to depict and quantify, but which can be of considerable interest to us. Take for instance the first map in the Tredegar atlas, reproduced here. A large and informative map, it was folded twice to allow its accommodation within Thomas’s volume. Close to the western edge is the town of Brecon. Charles Morgan’s holdings within the town were small although he did own the castle, and Thomas too depicted the priory church (now Brecon Cathedral) providing further context. 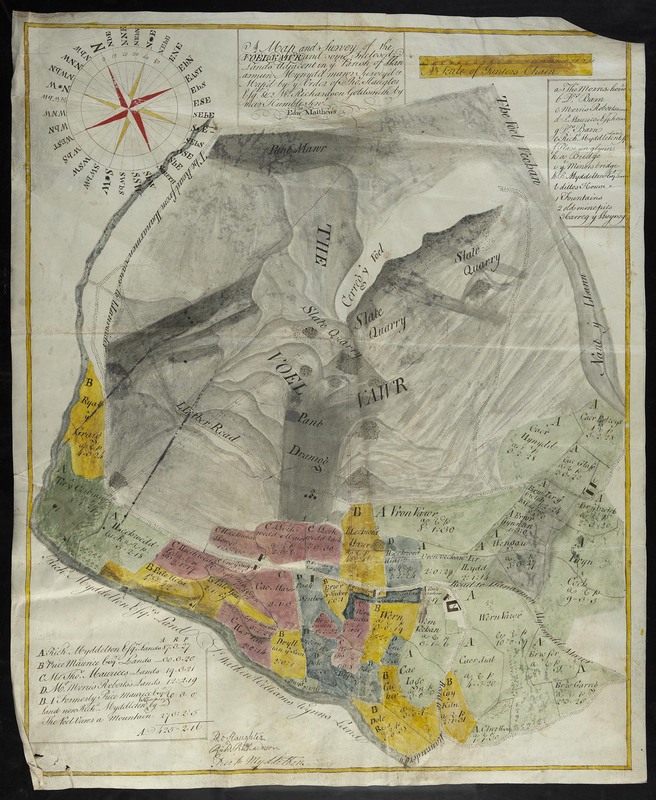 Now if we were to combine this map with Thomas’ depiction of Lord Camden’s holdings in and around the town, we would achieve quite a useful representation of Brecon as it was in 1780. Further east, and almost central on the map, is Slough Tump. Interestingly, this had been surveyed twenty years earlier by the Brecon surveyor, Meredith Jones, whose map is also in the National Library. Jones portrayed Slough Tump as a simple field, albeit a curiously shaped one, and adjacent fields were shown in a similar manner, bereft of any detail. Thomas, however, chose to label it an ‘old fortification’ (quite correctly, as it’s an Iron Age hillfort) and also gave it the intriguing title of ‘Ginger Wall’, presumably courtesy of a local informant, but a name that I have not come across in any other source. North of the tump but not on Morgan’s land was St Eluned’s Chapel: there are no visible signs of the building today, but evidently at the end of the eighteenth century its ruins were visible. And to the north-west of the chapel were relict traces of the medieval open fields around the town, showing as narrow strips, again something that Meredith Jones failed to show. Edward Thomas’s attention to detail, just in this one small area, can be rounded off with depictions of an ‘old bank’ and the ‘remains of a hedge’, field boundaries that by his day had fallen out of use. Its regrettable that there are not more eighteenth-century surveyors in Wales who had a similar appreciation for the minutiae of the landscape. 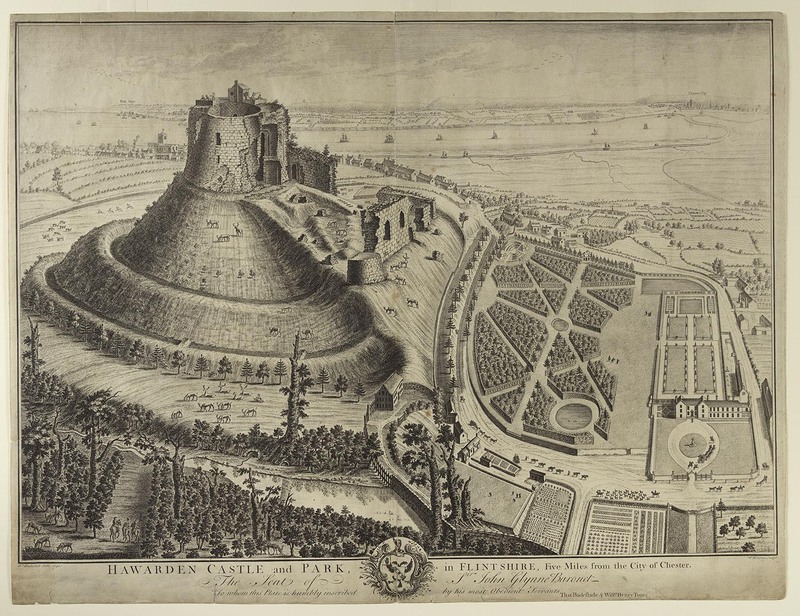 You’re perhaps wondering why this blog is accompanied not by a map but by a topographical drawing from 1740 of Hawarden castle in Flintshire. Simply put, it’s a surrogate image. The National Library as far as I’ve been able to establish holds no manuscript surveys by Thomas Badeslade – those that he prepared in Wales are to be found in the Flintshire, Cheshire and Bangor University archives, others remain in the muniments of the families that commissioned them nearly three hundred years ago. Badeslade, probably from a Godalming (Surrey) family and subsequently relocated in London, was one of several gifted individuals who in the first half of the eighteenth century ventured into different projects to make a living. Initially a map copyist, he turned successively to architectural drawing (in Kent and then further afield), a land surveyor, a fen drainage specialist and a producer of county maps. William Williams, a slightly younger contemporary of Badeslade who I’ve already highlighted through his map of Denbighshire and Flintshire, also diversified his efforts into different fields, and more famous than either now is John Rocque, of Huguenot lineage and also established in London, the creator of some of the eighteenth-century’s most important and distinctive maps. Why then select Badeslade for examination here? Firstly, I think, because we know a little more about him than many other surveyors of this time. Of William Williams the man and his career, we know virtually nothing other than any incidental details that can be deduced from his maps, an impediment that holds true for a significant number of land surveyors operating in the seventeenth and eighteenth centuries. But with Badeslade we have his testament, compiled a month before he died in 1744 (at Llandinam in Montgomeryshire) which amongst other things reveals that after a major altercation with his first patron Sir Robert Walpole at Houghton Hall, Norfolk – no surprise to those who are aware that our first prime minister was a notoriously difficult character – he had to seek patronage elsewhere, distancing himself in north Wales well away from Walpole’s influence. Then there is the fact that Badeslade’s mapping style developed over the quarter of a century that he was active, yet remains distinctively recognisable throughout this period. His testament refers to a commission that he undertook at Newmarket (now Trelawnyd) in Flintshire and for which he had yet to be paid. A draft of this map has been tracked down in the Bangor University archives, attributable not because it was autographed but because of Badeslade’s distinctive style. And finally there are the maps themselves. For the Grosvenor family of Eaton Hall near Chester, Badeslade mapped the upland commons of the various lordships they held in north-east Wales in the years 1738 to 1740. These are massive maps, one of them nearly three metres long. They are clearly delineated, the boundaries of the common closely defined, the settlements around their edges are shown and – a plus for the archaeologist and landscape historian – the remains of mining and other industrial activities on the commons themselves. 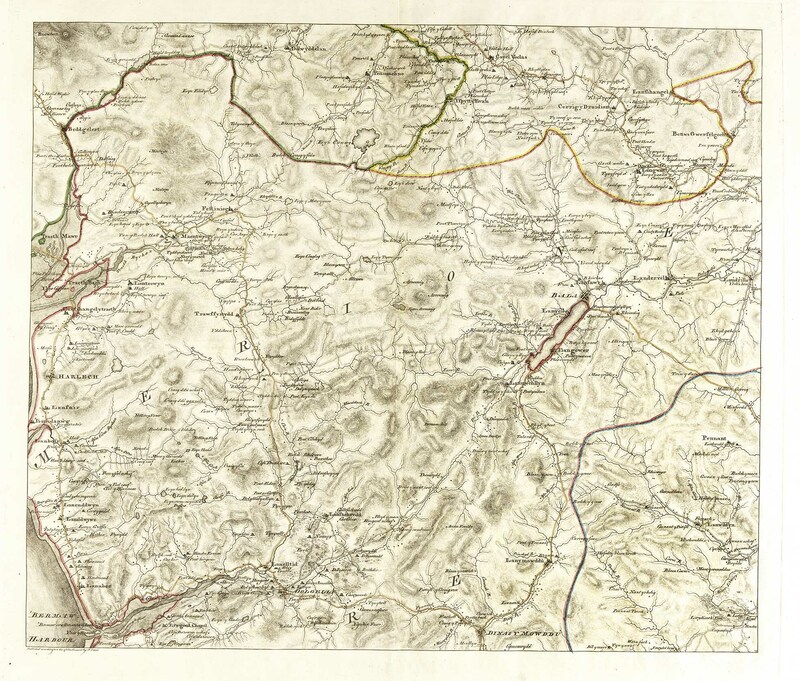 These maps are outstanding representations of the extensive upland landscapes in north-east Wales, and so vital to the running of the Grosvenor estates that a century or so later, a Mold mapmaker was well paid to make precise copies of them. R. Silvester.Thomas Badeslade: his life and career from eastern England to north Wales, in S. Ashley and A. Marsden (eds) Landscapes and Artefacts: studies in East Anglian Archaeology presented to Andrew Rogerson. Oxford: Archaeopress Archaeology, 2014, pp. 217-229. Thomas Slaughter and Richard Richardson will be familiar names only to those who have a deep interest in eighteenth-century mining activity in Wales. Slaughter is a fairly obscure individual, but Richardson was more obviously eminent, a goldsmith, an alderman in Chester for many years, and in 1757 the city’s mayor. As mining entrepreneurs they commissioned mapped surveys of areas likely to have unexploited mineral deposits prior to leasing the land from its owner. Edward Matthews, the first generation of a family of surveyors based in Mold in Flintshire, seems to have been their preferred choice and his name appears on a number of maps including two from the 1750s of the Chirk Castle estate holdings of Llanymynech Hill near Oswestry and the less well-known Voel Fawr as it is termed on the map shown here, the most prominent hill in the parish of Llanarmon Mynydd Mawr, historically in southern Denbighshire but now in Powys. Slaughter, Richardson and Richard Myddelton, lord of Chirk all signed the map, presumably confirming it to be an accurate representation of this upland landscape. 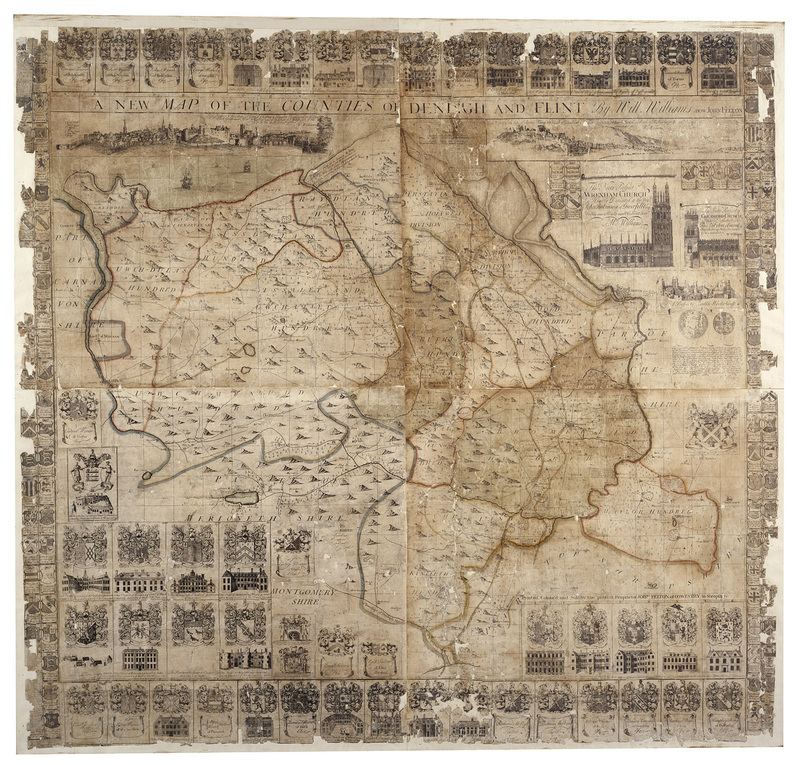 Edward Matthews’ map cannot by classed as an estate map in the strict sense of the term. It shows only a very small portion of the lands owned by Richard Myddelton and indeed depicts the lands of other freeholders; it is better termed a property map, and for me this is one of its strengths. Had it just been a depiction of Myddelton’s farmed estate, the unenclosed mountain land that was Voel Fawr would have received little attention because of its limited agricultural interest. Here though it is the mountain that was important for its potential mineral reserves. Matthews shows the terrain as a series of humps, in a traditional fashion that had been adopted by Saxton nearly two hundred years before. He depicts the various slate quarries that had been opened on what was almost certainly still functioning as common land in the eighteenth century, and also old mine workings, seen as groups of black dots, which would have attracted the specific attention of Slaughter and Richardson, as they do the archaeologist of today. Yet it is not the olive green wash employed for the mountain that attracts the eye, but the bright colours – brick red, yellow, slate green etc – adopted for the different freeholders’ lands, lying mainly to the south of a lane that tracked eastwards along the contours towards the hamlet of Llanarmon Mynydd Mawr. In particular it is the surprisingly mixed pattern of land holdings with strangely shaped fields which is of interest. And in this we are moving outside the province of archaeology and into that of socio-economic history, for the pattern is best explained as a consequence of the Welsh system of partible inheritance, whereby each of the deceased’s male heirs acquired an equal portion of his land. This contrasted with the English system of primogeniture where the eldest son normally inherited the entire estate. Matthews’ map unfortunately can’t provide the information as to when the fragmentation of the holding took place, and the irregular fields that show so clearly on his map are today barely visible in the landscape, having been swept away in a rationalisation of the field layout in the later nineteenth century. A question remains unanswered. Why did the surveyor show the land of various farmers? The answer probably lies in the fact that Richard Myddelton was the lord of the manor and claimed the mineral rights across (or more accurately below) other men’s land. There is though no archaeological evidence to suggest that Slaughter and Richardson exploited this option. As an archaeologist I have found little of interest in county maps. Almost invariably they were drawn at a scale too small to show details of the landscape changes that are significant for us in our studies. 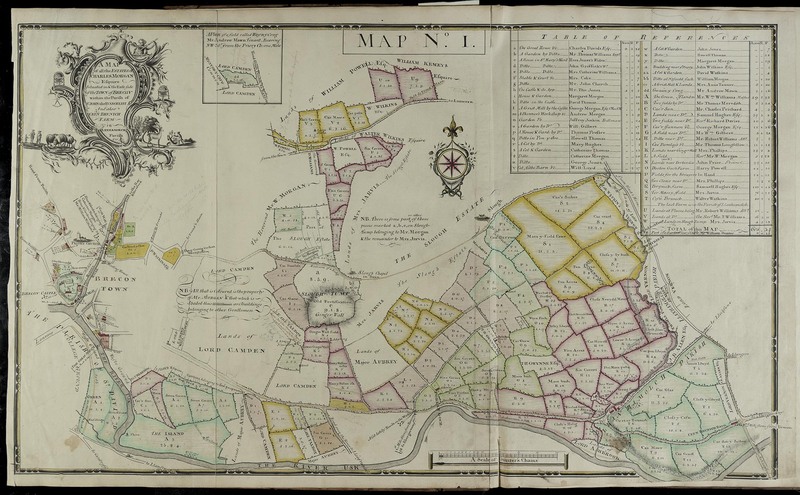 Over years of working in north-east Wales, however, I’d periodically come across references to William Williams’ New map of Denbigh and Flint, generally attributed to 1720 or 1721, in books and articles without encountering the map itself. What such references shared in common was the claimed connection with a handful of others from the early eighteenth century, together exemplifying a ‘new wave’ of county maps that succeeded those of Saxton, Norden and Speed from the end the sixteenth and beginning of the seventeenth centuries, with William Williams’ map the sole Welsh representative in a distinguished line-up . William Williams himself had an interesting if relatively brief career, producing some elegant estate surveys in the mid-1730s for big landowners in north-east Wales and Cheshire, before succumbing to a ‘gout in his stomach’ in 1739. He is though better known outside Wales for his volume of architectural drawings entitled Oxonia Depicta published in 1732-33. It was inevitable that in studying his estate surveys, I’d look at Williams’ earlier cartographic work, and two perhaps not unrelated facts soon emerged. One was that little had been written about the surveyor, a recent writer on Oxford’s historic architecture terming him obscure, which is probably in the context of middle England a fair comment. And of his county map, the only comments of substance are in a paper compiled by the National Library’s Glyn Walters in 1968. More intriguingly, it was apparent in 1968 and even more so today that despite the fact that this purports to be a printed map, only one original copy is known – that housed in the National Library – which might go some way to explaining why so little has been written about it. At first sight Williams’ map is rather different from its county predecessors. It is in modern parlance ‘very busy’. There is hardly a square inch of spare space because the compiler has packed in around the perimeter of the map a large number of armorial shields, each seemingly crossed referenced by number or letter to the houses of the aristocracy and gentry that are marked on the map itself. For the most prominent families – the Grosvenors, the Mostyns, the Wynns – the heraldry is accompanied by drawn elevations of their principal country residences. As if this were not enough blank areas around the mapped counties are filled in with prospects of Chester and Denbigh, two of the counties’ great churches – Wrexham and Gresford – though not we might note the cathedral at St Asaph, and the lead works or ‘workhouse’ at Gadlis near Flint. Yet evidence is accumulating, though it’s something I’m still working on, that Williams adopted elements of Saxton’s late sixteenth-century map or perhaps more likely one of its later derivatives for his own plan, rather than surveying the two counties anew. He then corrected or updated place-names, perhaps removed one or two buildings that had disappeared during the previous century and a half, but compensated by adding large numbers of mansions as well some major roads. Professor Mark Whitehead, Aberystwyth University takes part in our #LoveMaps Campaign. Global maps present challenges to cartographers. In attempting to represent the entire world, perplexing practical and political decisions have to be made. Practically, there is, of course, the issue of representing a three-dimensional sphere in two dimensions. 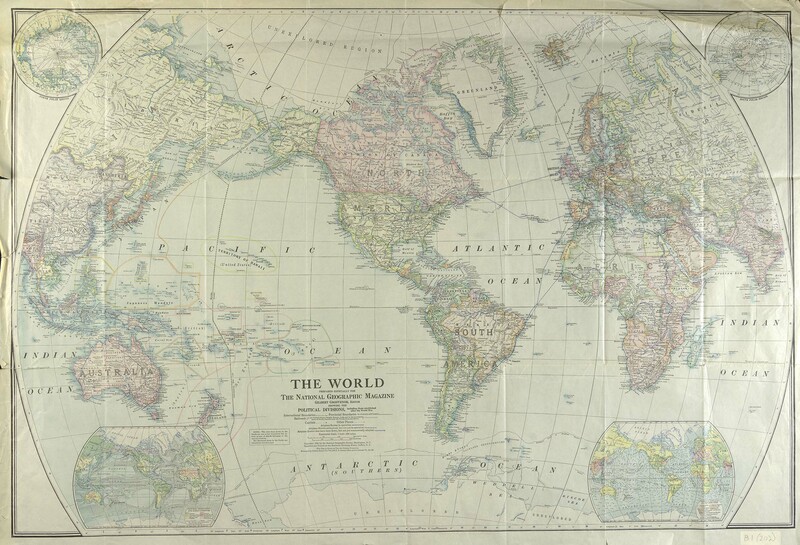 This challenge has given rise to numerous map projections of the world, ranging from Mercator to Cassini, and from Goode homolosine to Gall-Peters. Each projection has its own merits, perhaps related to its ability to avoid distortion, or its potential utility for navigational purposes. Politically, there is the question of what to place at the centre of the map, and what you relegate to its peripheries. Should the focus of the map be the Greenwich Meridian or perhaps the poles (as we see in the disorienting Cassini projection)? This political question of what should occupy the centre of our global cartographic projections provides a segue in to the map I would like to discuss within this post. This map of The World was prepared for the National Geographic Magazine ca. 1922. It has a number of interesting features. It outlines early trans-Atlantic aeroplane routes, many of which had been authorised, but not yet used (Charles Lindberg’s first solo flight across the Atlantic was not until 1927). The map also marks out several ‘unexplored regions’ in the Arctic and Antarctic. The map is based on the Van der Grinten projection. The projection is interesting for two main reasons. First, this is a ‘compromise’ map projection, which seeks to preserve the basic outlines of a Mercator map, while minimising its distortions. Second, the projection was conceived by one Alphon J. van der Grinten. Van der Grinten was an American who developed his map projections in the late 19th and early 20th centuries. Van der Grinten’s nationality may help to explain why the National Geographic Magazine (the magazine of the American National Geographic Society) may have commissioned a map based on this particular projection (van der Grinten projections are commonly found in the US). What is certain is that this particular projection accentuates the size and significance of Northern Hemisphere nations like the US, while diminishing the relative size of nations nearer to the Equator. What most interests me about this map, however, is not its projection, but its central focus. The positioning of the Americas at the heart of the map should come as no surprise: this is, of course, common for maps produced for US audiences. However, giving the Americas pride of place has interesting consequences for other countries. Russia is cut crudely in half, with parts of Siberia in the eastern hemisphere and others in the west. India is unevenly dissected with the most easterly territories (today largely constituting Bangladesh) suddenly appearing on the far west of the world map. I have never been particularly comfortable with Britain being the centre of global maps, given the colonial ideologies this has historically supported. Nevertheless, the use of the Greenwich Meridian as the centre of a world map does appear to do the least amount of damage the cartographic representation of other states of the world (with the vast expanses of the Pacific Ocean offering the edges of the map). But even then, Pacific Island states can often see their territorial integrities disrupted. Cartographically speaking, it appears that whatever projections and modes of division are chosen, world maps can never please all of the nations all of the time. My previous blogs in this LoveMaps Series have focused on the underlying geographical processes that maps can help to reveal, and the ulterior motivations that often inform cartography (maps are never innocent!) . These insights come together in my next choice of map, two Ordnance Survey sheets of Pembrokeshire. I initially chose to look at maps of Pembrokeshire because it is a county that holds special meaning to me. It is the site of my first holiday memories as a child, and the place I now take my own children every summer. When I was presented with these early Ordnance Survey maps of Pembrokeshire I was struck by their sophisticated simplicity. OS maps have the happy knack of being able to convey large amounts of useful cartographic information in an elegant and very readable form. If any maps were going to be “innocent” it was surely these. How wrong I was! On first inspecting these maps in the National Library of Wales I learned that Pembrokeshire was the first area of the Wales to be mapped by the Ordnance Survey. The reasons for this were twofold. Firstly, from its inception in the 18th century the “Ordnance” Survey was an operation designed to support military operations in Britain. 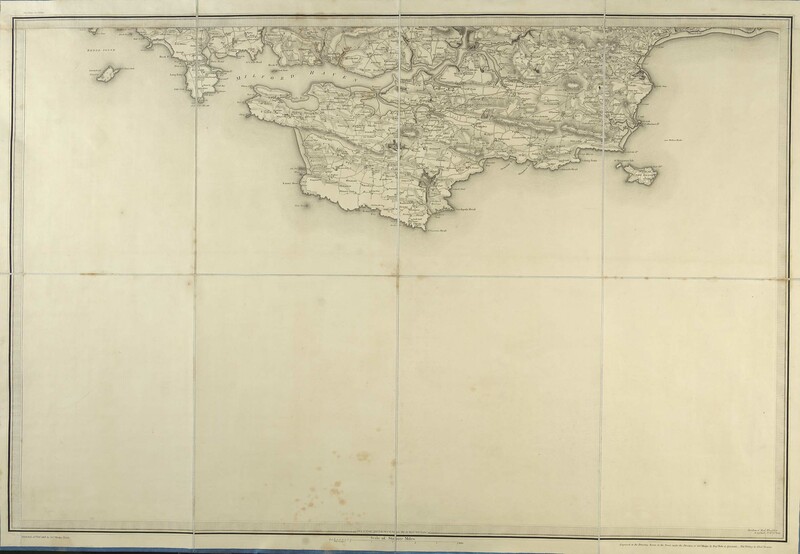 With revolutionary forces at play on the Continent, the Board of Ordnance was tasked with providing maps of England’s southern coast in case of invasion. The original Ordnance Survey was thus a survey focused on where best to locate military ordnance in the form of artillery in order to ward-off foreign invasion. Secondly, Pembrokeshire was the site of the most recent French invasion of Britain. The Battle of Fishguard was a short affair, which occurred on 22-24 February 1797. The French invasion of Pembrokeshire was actually a diversionary operation designed to distract Britain from a parallel invasion of Ireland, it failed spectacularly. Interestingly, it is now commonly referred to as the ‘last invasion of Britain’. For me, these are two beautiful maps of a place I dearly love. But these are also maps with military purpose that can tell us something of the processes of state building and defence in 18th and 19th century Britain. The concern that these maps clearly show for elevated land, coastal details, and road and river routes were not designed to serve the travelling tourist, but the British military. These reflections may seem interesting (hopefully), but anachronistic: the OS is no longer in the service of the Britain military. This may be the case, but military interests will always shape national cartographic practices. Next time you pick-up an OS sheet, you may want to pay attention to the lack of detail they provide of existing military sites in Britain and what goes on there. Maps that once made things visible for military purposes can also assist in making things invisible when necessary.